Among the most challenging and potentially useful skills an artist can have is the ability to design entirely new characters, environments and vehicles. Master these skills, and the doors open not only to your own creative expression, but to potential employment in the video game, film and publishing industries. In this tutorial we will walk through the design and painting of an extra terrestrial seaplane in Photoshop. This requires research into the familiar elements of real-world aircraft, and combining those elements into an original form that looks functional and familiar, yet clearly non-human. Let's get started! The following reference images and assets were used during the production of this tutorial. For an image at this level of detail, you will want to create a new canvas of as large a size as your computer can handle. Keep in mind that as you work and the image gets more and more complex, performance may degrade. My working canvas is set at 4700x3316 pixels; a widescreen presentation suitable for a long, low vehicle such as a seaplane. Once you have your new document, collect and analyze your research materials: In Ultralight for example, we see that the engine is placed high on the vehicle to prevent seawater damaging it. This image also shows how some seaplanes have small windows on their undersides allowing the pilot some downward vision. From Seaplane Dock we also learn that the floats of seaplanes are usually supported on a series of struts, braced with wire. There are usually two or more, to balance the vehicle when it is at rest on the water. This image offers other clues too - The floating dock allows seaplanes to land in places without permanent piers designed to moor them. To view your references while you paint, make a new image large enough to contain them all at reasonable resolution, in this case 1500x3000 pixels. Place your references in this image, leaving it open in your workspace. Now, move the canvas containing your references to the upper left corner and resize it so that it is large enough to see, but small enough to not intrude on the main working canvas. Now, on the menu bar, select the Window dropdown menu > Arrange > New Window for References. This will create a clone of your reference canvas: Perform this action again to create two clones, and then reposition them around the working canvas, zooming each onto a different image or element from your references. Now the design process can begin; select a small, round brush set to 75% opacity. Taking elements you like from the references, but never directly copying them, create a new layer called "Line Art 1" and begin to very roughly work out a shape for your aircraft. I have chosen a side-on view to best show off the vehicles' form. Note that although it looks strange, the key elements of a floatplane are there: A high mounted engine, stabilizing floats (in this case 2 on each side plus the central float) and a pointed, aerodynamic form with good downward visibility. The slightly raised "head" of the plane is designed to take into account the rough shape of the alien species I have in mind, which itself has a long bird-like neck. Taking the high mounted engine design from the Ultralight reference, we combine it with the in-line aircraft engine Engine from the reference. The fictional planet is hot, with very thick air, and so these considerations come into the design here: The propeller blades are broad and petal like, to cut through the dense atmosphere, and a tall radiator is placed in front to dissipate the heat from the engine on this hot world. It is important that you allow the nature of the intended environment to influence the design; this attention to detail adds an extra layer of plausibility to your creation. Now that we have a rough design, select the layer "Line Art 1" and lower its opacity to about 12%. Then create a new layer above "Line Art 1" called "Line Art 2" and set a round brush to 100% opacity and roughly 7 pixels in width. Begin to trace and refine your first sketch on this new layer, filing in details as you go in a precise, clean manner. Reference both your initial sketch on the layer beneath, and your various references. Do not be afraid at this stage to alter parts of your design: Note the changes made to the engines, wings, and propeller. Once you have completed this cleaned up line art, turn off the layer "Line Art 1"
Now we need to prepare the design for painting. To do this, we must create the layers and layer folders for each element: For each major component, create a new layer folder beneath the layer "Line Art 2" and rename it Pier. The Plane and the Background are other major components, and as such get their own folders too. Within each folder each sub-element will need its own layer, so we create the following layers shown below. Note that layers are stacked so that objects in front of others in the painting are higher in the layer stack, and objects such as the sky are placed towards the bottom so that they do not obscure foreground elements. At this stage, we can begin to block in the main areas of the image in simple colors. It doesn't matter which colors, as they will all be painted over later. Change the opacity of "line Art 2" to approximately 14%, and using it as a guide, color all the major elements you previously created layers for. Now comes the time to begin the true coloring. To set the tone, take the reference image "Evening Dock" as a rough guide and use a soft brush to begin painting the basic elements of the sky, moving from a warmer tone on the right to a cooler tone as you near the upper and left edges of the image. There is no need to be ultra-precise at this stage, but rather to set the lighting level for the rest of the elements in the picture. With the basic sky established, we need to start on the waters' surface. Not as daunting as it may appear, this effect is most easily created through the use of custom brushes. First, elect a basic color for the water. This should be similar to the sky, as the water's surface will be reflecting it, but somewhat darker. Use your references to determine a value that seems appropriate. Now, a custom brush must be created to generate the gentle ripples on this flat surface: Create a new image at 500 x 500 pixels and, using your references, draw a series of simple, tapering wavy lines with a solid black brush as shown below. Once you are happy with it select Edit > Define Brush Preset. Now, save your custom water brush somewhere and close it. Select your brushes palette and scroll to the very bottom - you should find your custom brush. At this stage it is of no use for creating water and must be further modified. Open your Brush Settings box and input the values in the following steps, then save the brush: it should now appear in both its original and altered forms at the bottom of the brushes stack. Now, taking the custom brush, experiment with different sizes and begin to work in a water pattern, remembering to change the brush to a smaller size the further into the distance the surface of the water would be. Take special note to create a dark reflection and shadow beneath the seaplane. With the basic background established, it now becomes possible to begin painting the aircraft itself. Select the Engine layer and lock it using the "Lock Transparent Pixels" function: This incredibly useful setting makes it impossible to 'spill" your paint outside of the already painted area, making coloring far easier. Make sure to switch this function off if you ever need to make changes to or erase parts of a layer. Now, take a soft brush and using your references as a guide, paint in the forms of your engine. Keep in mind the direction of light coming from the sky, and cast shadows in the direction indicated below. Once the engine has been colored you can begin on other parts of the vehicle. Next is the main body; select Lock Transparent Pixels and proceed to define areas of light and shadow by imagining the light falling from the sky onto the aircraft from above and to the right. Sometimes the nature of Photoshop brushes can be a handicap when trying to create sharp edges or precise airbrush type effects. To achieve these results we can use the lasso tool: Using either Lasso or Polygonal Lasso select the areas you wish to paint and use a soft brush to gently paint across them with your stylus. Using the techniques described above, apply them to the other elements of the vehicle: To give the wings the appearance of a curved aerofoil, a soft gradient is used, whilst the hard edged vertical stabiliser and support struts can be simply shaded with areas of flat color combined with a lit leading edge. At this stage we paint the final major element; the pier. Using your references, we begin by painting in the barrel floats beneath the upper surface. We want them to appear old and rusted, giving this alien scene a "lived in" appearance. Taking a soft brush and paint in the barrels with a mixture of dark oranges and browns. To further enhance this effect and get deeper shadows, set your brush to multiply and around 50% opacity to paint more depth into the shadows and seams. With the barrels complete, we can now move on to the pier surface. Provide the basic shading in dull greys, and add a few cracks and rust spots to enhance its apparent age. Now to add texture to the pier. 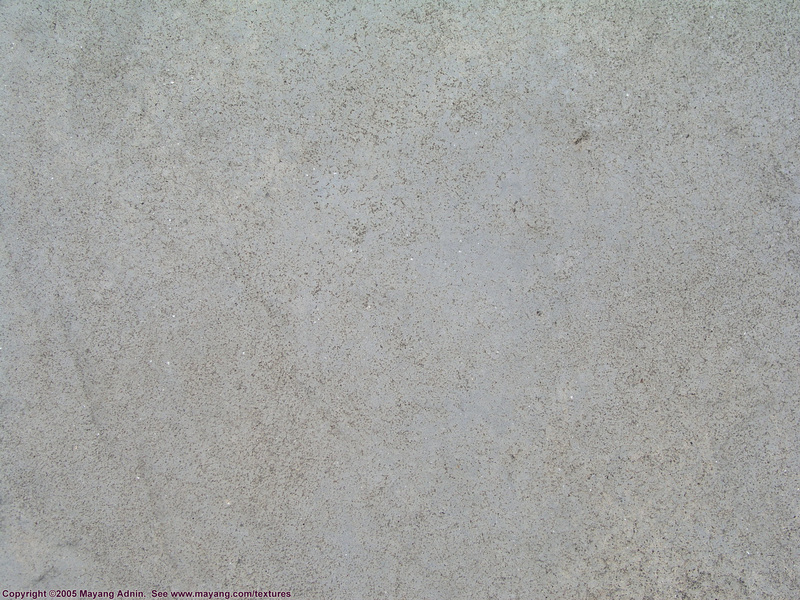 Take the provided file "Concrete" and paste it into your image on a separate layer above the pier. Now using the Edit > Transform > Skew and/or Distort tools, modify the texture into the approximate size and shape of the pier surface. Then reduce the texture layers" opacity to about 50%, allowing you to erase any excess so that it fits the cement section precisely. With the texture in place, change the layer mode to Multiply: Adjust both the opacity of the texture layer, as well as its Brightness and Contrast until it looks like shaded, aged cement. When adjusting the Brightness and Contrast settings, make sure to select "legacy" in the tick box to allow for more accurate control. Now we need to detail the interior of the aircraft's cargo hold. Using the Chinook reference we methodically block in our basic colors on several layers. The main Cargo Bay layer forms the base, while a new layer called "Struts" is painted in the style of the Chinook reference image. Shadows need to be added to give form to the struts inside the hold. Create a new Layer Folder called "Shadow" above the Struts layer, and set its effect to "Multiply". On a new layer within this folder, begin painting in the strut shadows, assuming that a bright light is being cast on them from above. Select a color for this layer that compliments the aircraft's interior green, using the approximate values below. To add the bright internal lights of the cargo bay, we will make use of a simple layer effect. Create a new layer called "lights" and using a medium sized hard brush, draw a series of simple white strips near the top of the bay. Now double click this layer in the Layer Palette to bring up the Layer Style settings. Select "Outer Glow, and input the values from the following steps. To add more complexity, create a new layer called "Details" below the "Lights" layer. Paint in a series of simple lamps and pipes in dark grey or black around the edges of the door opening. For further detail, add a set of support poles against the walls of the cargo bay doors. Then, select Lock Transparent Pixels on the Struts layer and use a soft brush to add variety to the lighting and colors with a soft brush. Once complete, follow these steps also for the base Cargo Bay layer. Rust can be added by drawing a soft brown/orange brush set to multiply across the layer, making sure that the rust streaks flow down in the direction gravity would pull them. For the final touch, create a new layer above all others in the Cargo Bay and use a large soft, light green/yellow brush to add a haze effect. Now that all the basic elements are in place, it is time to begin the next level of detailing. Starting with the engine, observe your references and use the techniques of Step 15 such as the Lasso tool to add further detail to your vehicle components, in this case propeller blades and exhaust pipes. Note also that as part of the design process I reverted to the petal shaped blades of the initial sketch, illustrating the importance of saving multiple versions of your working image to preserve good ideas you may wish to return to later. To add more interest to the fuselage, we will now start adding more color. First, hold Ctrl and Left Click the small preview window of you Fuselage layer. This will add a selection border around the aircrafts" body. Now on top of the fuselage layer, create a new Layer Folder called "Patterns" and set it to multiply. On a new layer within this folder, take a hard round brush and paint a pattern across the surface of the aircraft in a deep blue. Additional detailing is now possible on all of the aircrafts" major elements, including some minor redesigns. On a new layer between the folder Patterns and the layer Fuselage, create a new layer called Lines and using a small round brush, paint in a series of panel lines across the vehicles" body. On the main float, to give a fabric-like appearance to the panel lines, paint brighter borders where the panels enter shadow, giving the illusion of raised edges. Further detail to the vehicle needs to be added manually at various points. Two round servicing caps have been added to the fuselage, as well as a navigation light to the tip of the wing. Taking note of the crosswires in your aircraft reference images, we can also create a new layer above all the other Aircraft layer folder elements to add these details: Take a small hard edged brush and select a dark blue/black to paint in various antennae wires and support cables linking various parts of the vehicle. To add detail to the wings, we need to give the illusion of their surface being made of transparent, reflective plastic. Create a new layer above "Wings" called "Rib", and paint a gently curved line from the dark wing border to the trailing edge. Now, hold Alt + left Mouse Button, and simply drag the Rib to duplicate it. Do this in series until the ribs are evenly spaced from the tip to the base of the wing. To further enhance the environment, we will need to create additional elements. First, create a new layer in the Background layer folder called "Mountains" between the "Sky" and "Water" layers. Taking a soft round brush, gently and randomly dab in the forms of a few hills on the horizon. To further enhance this effect, create a new layer at the top of the Background layer folder contents, named "Haze". Taking a soft round brush, draw it across the horizon line where the water meets the sky, creating a smoky layer of morning mist, which enhances the feeling of atmospheric depth in the piece. This step was the most pivotal in the paintings" development, and illustrates the need to take chances and risk radical redesigns to get the outcome desired. First, turn off the Line Art Layer, as sufficient detail has been painted to make it redundant. Then merge all layers of the aircrafts" body elements, excluding the wings, engine, support struts. This will create a single new layer containing all the major fuselage elements. Next, using the Lasso tool, select the front cockpit area and select Edit > Cut, then Edit > Paste. Move the resulting new layer containing the front section of the aircraft back to its approximate original position. The key to the success of this experiment was the discovery that with the following actions, the design of the aircraft was improved: With the layer containing the now detached section of the aircraft still selected, go to Edit > Transform > Flip Vertical, and position this now inverted cockpit in an aesthetically pleasing position. Now it becomes necessary to weld this now inverted section back to the main body. Using a soft, hard edged brush and the lasso tool techniques from earlier, paint the cockpit back onto the body by extrapolating from each component. With the cockpit now inverted, the windows are no longer correct. Erase the old windows with a hard edged brush, and repaint the silhouette of the interior details with a hard edged brush. As a final touch, use a soft brush set at low opacity to add a lever of reflectivity to the upper windshield, as shown. Continuing in the spirit of re-design, an additional level of detail can now be added to the pier. Create a new layer at the top of the Pier layer stack, named "Plates", and use the Polygonal Lasso tool to outline a series of irregular sections of metal. Now with a soft edged brush, paint in this selected area the color of steel, which not only reflects some of the sky's blue, but also the green light emerging from the airplanes" cargo bay. To complete the effect, take a soft rust brown brush and set it to Multiply. With Lock Transparent Pixels selected, run it along the edges of the Plates layer to add a rusty, aged appearance. Now draw a single dark line with a hard edged brush from one side of the pier to the other. Hold Alt and drag this line to duplicate it, and align this too along the pier's axis. Continue until the whole pier is covered with regularly spaced slats, and then Shift > Select all the line layers, hold Ctrl E to merge them, and erase the excess. To complete the new pier, set the layer containing all the black lines to Multiply, and with Lock Transparent Pixels engaged run a soft bright blue brush over the brighter areas of the pier to lighten the lines and blend them better to the surface. Then select the pier surface layer once more and add final surface details using a variety of brush sizes, colors and shapes in a random pattern. Returning now to the sky, a much more dynamic environment can be created relatively easily. Create a new layer in the Background layer folder above the Sky layer. Now, take the brush shown below from Adobe Photoshop CS5's standard brush set, and select the Tablet Pressure Controls Opacity setting. Using your references as a guide, gently paint in the forms of clouds using small random brush motions. To give the illusion of falling sunlit rain, take the same brush, increase its size and with a light blue/white hue selected simply draw it down like curtains in broad strokes across the sky. Describe a gentle curve with your brushstrokes to give the illusion of a slight wind pushing the rain off course. Now that the major elements are painted, the water can be brought to completion. It was important to wait until this stage as the reflections and light patterns depend largely on how the other elements of the painting turned out. Take the custom wave brush we created in step 10-11 and, taking eyedropper color samples from the plane, rusted pier barrels and sky, paint in areas of reflection and light based on what is directly above the area you are painting in the picture. For added fine detail, take a standard round brush and manually paint in broken reflections of the airplane's support struts and cables. For finishing touches a final few elements are required. The first is our alien crew. Referencing the image "Birrin", we can directly paint in our creatures without using line art as a guide, since they will be a minor aspect of the composition. Start by blocking out their shape with blue/black, using a solid round brush. Next, using the Lasso tool, select areas of the body working from the head and neck back down towards the legs, and use a soft edged brush to gently paint in areas of highlighting. Since they are under the wings" shadow, the light falling on them will be the green from inside the cargo bay. Add some simple clothing, consisting of panels covering a few major joints and the head to add further detail and definition. Although not essential, some images benefit from a virtual framing, which can enhance the sense of depth. Create a new layer above all others in the scene and, using the Rectangular Marque Tool, select and then fill black two long rectangles at the upper and lower edges of the image. To further enhance the sense of depth granted from the frame, it can be useful to link the foreground and midground elements within the painting. To link the pier to land, a small area of beach will be added along the bottom of the image. Create a new layer above the Pier layer folder stack called "Beach" and taking a soft brush set to 80% opacity manually paint in the sand using a mix of colors taken from the rusty barrels, and a base tan color. To create the small beach plants use a small black hard edged brush to sketch in an area of small upright stalks and then highlight their sunward sides with some red sampled from the rusted barrels. The final stages of detailing are the ropes and fuel cables on the pier. These additions give the painting an enhanced sense of realism, making the fictional world seem more "lived in". The penultimate stage involves using effects layers to maximise the aesthetic appeal and even change the mood of the painting. Create a new layer folder called "Effects" at the very top of the Layer Palette, above all others. Now at the bottom right of the Layer Palette, click the half shaded circle and select Solid Color. This will create a new opaque layer: If it is not already there, place it in the Effects layer folder. Right now the layer simply blankets everything beneath it. So while it is selected, change its Layer Effect to Overlay. Now, place your cursor over the small colored square in the Effect Layer and double-click. This will bring up the color palette, allowing you to select and experiment with various colors. Follow the steps below to enhance the painting's final appearance. When exporting the image for publishing, understanding the needs of the chosen medium is critical: For the web, the size needs to be optimal for viewing on a standard screen in a web browser. First saving the image with its layers intact, select Layer > Flatten Image and follow the steps below to change the image size to 1100x541 pixels. This smaller image can now be enhanced further using Filter > Sharpen > Smart Sharpen. Use the sliders to select values you feel best enhance the image and save the file in your chosen format. Alex Ries is an illustrator and concept artist from Melbourne, Australia.